This example shows how the appearance (style) of scale breaks can be modified. This example demonstrates how custom scale breaks can be added on the chart primary X and Y axes. 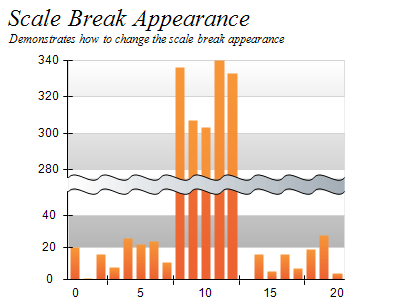 This example shows automatic scale breaks on the Y chart axis. Scale breaks will be introduced when the data shown on the axis is not regularly spread over the axis range.